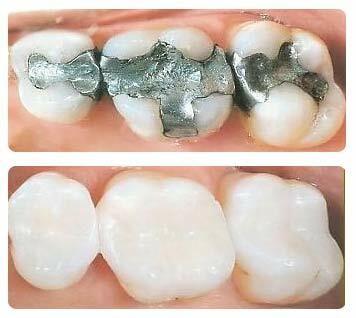 We are often asked in our office about the use of Amalgam (Silver) filling material. In the past, most patients had amalgam fillings placed on back teeth to repair cavities. White composite (bonded) fillings have been used on front teeth for cavity repair. Amalgam has been a good restorative material for back teeth, providing a relatively low cost alternative to the older style, expensive gold fillings. White bonding on back teeth was limited to a selected number of back tooth situations due to the limitations of the bonding material themselves. · They cosmetically blend in with the color of the tooth . · They have been found to strengthen the remaining tooth portion more than amalgam, decreasing the potential need for a crown on a tooth at a later time. · They are as hard and long lasting as amalgam. · The use of composite can help to avoid the speculated yet unproven potential health risk of using Amalgam which is a mercury-based filling material. Although amalgam remains certified safe by all major health organizations such as the FDA, NIH, and World Health Organization, certain researchers are now questioning the safety of amalgam, due to its mercury content in its non-set form. Despite any firm hard scientific evidence, several states (including Maine) have passed state legislation to restrict the usage of amalgam in certain types of patients or requiring amalgam alternative education to be provided to patients. Composite fillings do require more time and care to place properly. This accounts for its slightly higher fee, but we feel that the advantages listed above justify the use of the better, more modern materials available to us today.